My Secret Hideout is not a game. It is an interactive toy... or rather poem... or artwork... It’s an interactive textual art generator set in a treehouse. Play around with it! This is what the iOS version looked like. Drag leaves down and attach them to the tree. Every time you add a leaf, the description of the treehouse grows and changes. The changes are random... aren’t they? My Secret Hideout is available now on Itch.IO. Free to play with! Drag a leaf from the top, and drop it down next to the root of the tree. (Not right on top of it!) It will stick. There — your tree has grown a new branch. Now look at the text on the left. It doesn’t say what it said before. Try adding another leaf, or moving one of the leaves around. Every change you make causes new possibilities to unfold. As your tree grows larger, new rooms may appear in the treehouse. How many possible texts can it generate? At a rough estimate, a googol different combinations. That’s 10100, give or take a few dozen orders of magnitude. 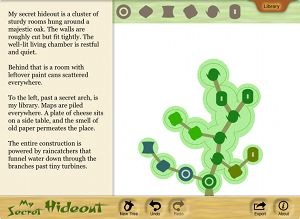 I originally released My Secret Hideout in 2011 as an iOS app. It was my first iOS app, in fact! People found it amusing, but not very many people — it’s sold something like 700 copies over five years. Andrew Plotkin is the author of many well-known works of interactive fiction. He lives in Boston, Massachusetts, where he is hard at work researching both classic forms of digital interactivity (like Hadean Lands) and new forms (like My Secret Hideout). If you have any problems, see our support page, or contact support@zarfhome.com. My Secret Hideout is a Zarfhome Production. My Secret Hideout is copyright 2011-17 by Zarfhome Software Consulting, LLC. The logotype font is Space Patrol by Nick Curtis.